Arunachal Pradesh and Assam have been put on high alert of possible flash floods after China informed India on Friday that a landslide has blocked a section of a Yarlung Tsangpo river in the Tibet region, that flows into Arunachal Pradesh as Siang and further downstream in Assam as the Brahmaputra. An artificial lake has formed on the Yarlung Tsangpo in China on Wednesday after a cliff fell on a section of the river, leading to fears of large-scale floods if the dam formed by the landslide breaks. The East Siang district administration in Arunachal Pradesh has asked people not to venture near the Siang River and asked them to stay alert. The water level in the Siang has reduced due to the landslide blocking the flow of water. “We got a report from the Central Water Commission (CWC) about the landslide in Tibet. The water level in Siang river has gone down by around 2 metres at Tuting in Arunachal Pradesh,” Duly Kamduk, deputy commissioner of Upper Siang district, was reported as saying. Reports said a landslide has led to the formation of an artificial lake on the river and there are fears of large-scale floods downstream if the lake breaches. The Central Water Commission (CWC) has alerted the Union government on this. Chinese media said over 6,000 people have been evacuated after a barrier lake was formed following the landslide in the Yarlung Tsangpo. The landslide is stated to have struck near a village in Menling County and the water in the artificial lake has risen to 131 feet by Thursday, according to Chinese authorities, said a report by Associated Press. More than 6,000 people were evacuated and more will follow after a barrier lake was formed following a landslide that blocked the Yarlung Tsangpo River in the #Tibet autonomous region. According to reports from Tibet, the blockade was 3.5 kilometre long and 2.5 kilometre wide at the widest point, and was 17 kilometres downstream from the Nexia Hydrological Station in Tibet. The Assam government has issued an alert in Upper Assam and the districts of Dibrugarh, Dhemaji, Lakhimpur and Tinsukia have been asked to be prepared since the Siang flows into the Brahmaputra in this region. The centre has deployed additional National Disaster Response Force (NDRF) from Kolkata and Bhubaneswar to this region. According to Arunchal Pradesh government sources, Beijing has informed New Delhi that the artificial lake at Yarlung Tsangpo had begun spilling over at around 2 PM resulting in an unprecedented rise in water levels, reported The Indian Express. A huge volume of water is expected to enter India through the Sino-Indian border at Tuting by Saturday afternoon and is expected cause flash floods in the Siang River by Saturday evening. The Central Water Commission told the Assam government that China had shared data on the breach with India, saying that the lake water storage is increasing at a rate of 8 million cubic meter per hour or 80,000 cubic meters per second. According to reports from China, the barrier lake was created on Wednesday morning following the collapse of a cliff in the deep valley through which the river flows. The cause of the landslide is believed to be natural and there was no report of any earthquake in the area in the recent past. The Siang got flooded due to heavy rainfall on the Chinese side. External affairs ministry spokesperson Raveesh Kumar has said that India and China are in regular contact on this matter. 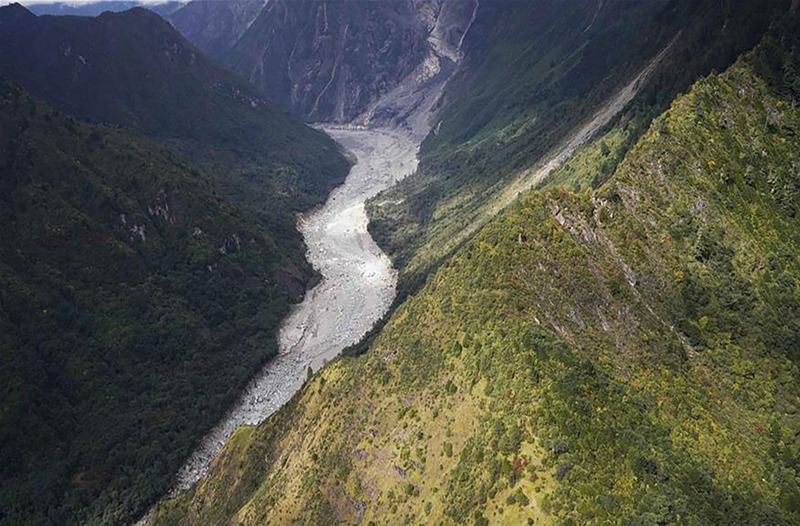 “On October 17, the Chinese side informed us about a landslide blocking the main stream of Yarlung Zangbo/Brahmaputra River in the Tibet Autonomous Region…Based on the information provided, all relevant authorities of the central government and concerned state governments have been apprised about the emerging situation to enable them to take necessary precautionary measures. We are in regular contact with the Chinese side for further updates,” he said. Congress MP Ninong Ering has written to foreign minister Sushma Swaraj to immediately take up the matter with China, according to media reports. “The Siang has almost dried up, which is very unnatural. And if the dam breaks, there could be large-scale damage in Arunachal Pradesh and other states downstream,” the Lok Sabha member wrote to Swaraj on Thursday. “According to Chinese ministry of water resources, the landslide took place around 80 km downstream from the Nuxia hydrological station in Linzhi in Tibet. That’s around 100 km from the Indian border,” Ering said. In August, several people were airlifted from Assam’s Dhemaji district as the Siang River was flooded due to heavy rainfall in the Chinese area. Last year, the Siang had turned brackish and extremely turbid, raising concerns in India of a fallout if China build dams in its upper reaches.